Background: Drugs of abuse affect both central nervous system (CNS) and peripheral immune function. Besides the involvement of dopamine and glutamate systems, chronic exposure to drugs of abuse alters immune homeostasis, promoting a pro-inflammatory status. At the same time, impaired peripheral immunity leads to an increased susceptibility to infections in drug abusers. Discussion: There is evidence that certain drugs, such as opioids, activate microglial cells and astrocytes which, in turn, provoke central neuroinflammation. Particularly, opioids bind the Toll-like receptor (TLR)-4 with increased expression of nuclear factor kappa-light-chain-enhancer of activated B cells and release of pro-inflammatory cytokines. Peripheral mediators released by immune cells also contribute to aggravate central neuroinflammation. Conclusion: These are based either on the inhibition of TLR-4 activation by drugs of abuse or on the correction of dopamine and glutamate pathways. 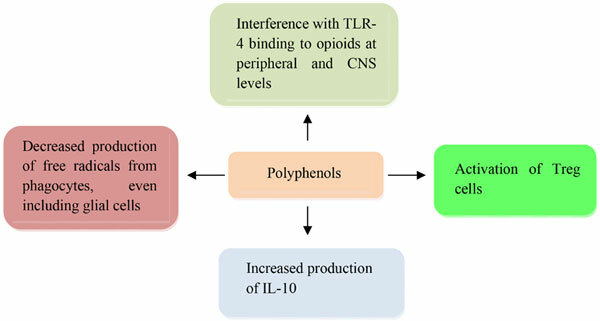 Finally, a hypothetic nutraceutical intervention with polyphenols in view of their anti-inflammatory and anti-oxidant properties will be outlined as an adjuvant treatment for drugs of abuse-related disorders. Dopamine, drugs of abuse, glutamate, glial cells, immunity, neurotransmitters, polyphenols.